May is a beautiful month here in Panama City, the temperature’s haven’t heated up to summer time high’s so you can stay out on the water all day fishing or just kickback and enjoy the sunshine and the beaches! The bait has arrived in the bays and off the beach and the bite nearshore and off the pier has been getting better everyday. If you enjoy using live bait now is the time to throw a net and load up that livewell. All species are moving in to take advantage of the bait fish. Everything from Kings, Sharks and Tarpon off the beach and inshore spots, to the Spanish, Ladyfish, Blues, Trout and Reds up in the bays. Using live bait is pretty straight forward, try free-lining them by themselves or create a chum line by throwing out a few and then fish your bait back in the chum line for a chance to catch any number of different species. If you are targeting trout and reds, try fishing your live bait under a popping cork while working your way across a grass flat. Be sure to keep your bait suspended just above the grass and don’t forget to work the edges where the sand meets the grass. If you want more of a challenge and live bait is not your thing, tie on an artificial and get going. May is a great month for top water action for reds and trout. When using top water vary the retrieval of the plugs until you find what’s working. You may even have to change the lure size and type of action to fine tune your presentation but it’s worth it when the bite turns on. Later in the day switch over to your favorite swim or jerk bait or gold spoon and work the grass lines and pot holes for Reds and Trout. Be sure and stop by one of the local tackle shops and they will be happy to show you what’s working best this time of year. Spanish, Blues and Lady fish. These fish can be targeted with live or artificial baits. Gotcha’s, spoons, and assorted jigs will work and when caught on light tackle they are a blast and will provide a lot of fun for the whole family! Fly fishing off the beach or up in the flats is always a blast. In May, so many different fish provide plenty of targets to pick from. 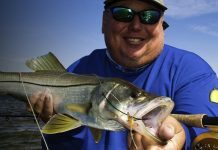 Shark, Jacks, Pompano, Spanish, and Bull Reds are generally targeted off the beaches and Speckled Trout and Reds are sight fished up on the grass flats! 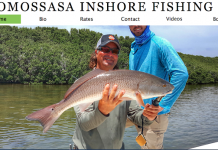 If you find yourself in town without your fly gear and want to experience the incredible fishing and fly opportunities in Panama City Beach don’t worry, I have everything you need to have a great day on the water.